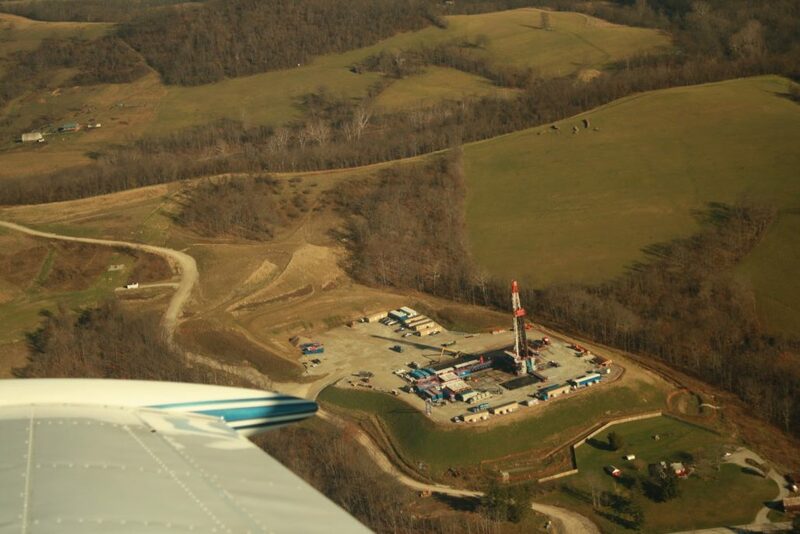 Last week I posted Part I of our LightHawk flight over West Virginia’s most active unconventional gas field in Wetzel County. Part I highlighted what an actual hydraulic fracturing job looks like and illustrated a chronic issue in rugged terrain – frequent “slips,” which are effectively small landslides. Today I will point out several more issues that were readily visible from an aerial perspective: infrastructure, habitat fragmentation, and proximity to homes. While not discussed nearly as much as water contamination, buildout of natural gas infrastructure is a certain impact of unconventional shale gas development. Gas separator units and condensate tanks remain on the wellpad for the productive life of the well, pipeline networks crisscross the fields and forests to connect all of the wells to market, compressor stations will run as long as there is gas moving through the pipelines, and large petrochemical facilities set up shop in traditionally rural areas. These facilities have a big footprint on the land, and contribute to air, noise, and light pollution in largely rural areas. Our colleagues at the Wetzel County Action Group tell us this ridge has been lowered at least 100 feet. It is apparent that the terrain has been heavily modified. Add miles of access roads and pipeline right-of-ways to the footprint of development and the total area impacted increases considerably. In mixed land-use areas this may not be a major issue, but in contiguous forests and state game lands fragmentation has serious ecological consequences. The USGS recently published a paper on habitat fragmentation in Washington and Bradford County, Pennsylvania, using aerial image analysis and GIS like we do here at SkyTruth. They concluded that change was occurring in the these counties, but was not yet very significant due to the high quantity of pre-existing fragmentation of those areas. The paper explains the concepts of fragmentation very well but we need to see similar studies conducted with a narrower focus (such as the Loyalsock State Forest in PA). In the background of the Mark West Facility, two pipeline right-of-ways are visible in the center and to the right. These are just a couple examples of the miles of pipelines and service roads that will disect the forests of active gas fields for the lifetime of well-production. However, infrastructure, fragmentation, and air, noise, and light pollution may seem to be insignificant if human residents aren’t directly impacted by it. 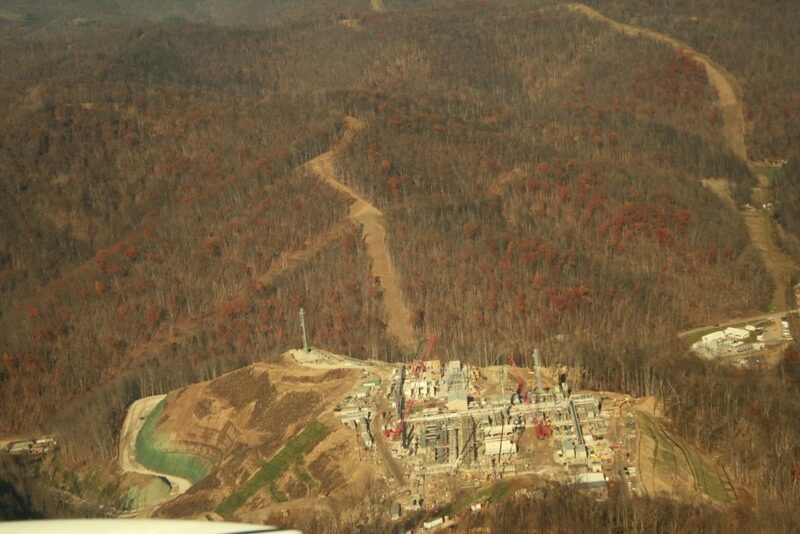 Biodiversity loss aside (a topic for a whole different post), in Wetzel County and across the nation, residents are experiencing a growing number of well pads, compressor stations, and other facilities moving in close to home, bringing us to the final point for this post. 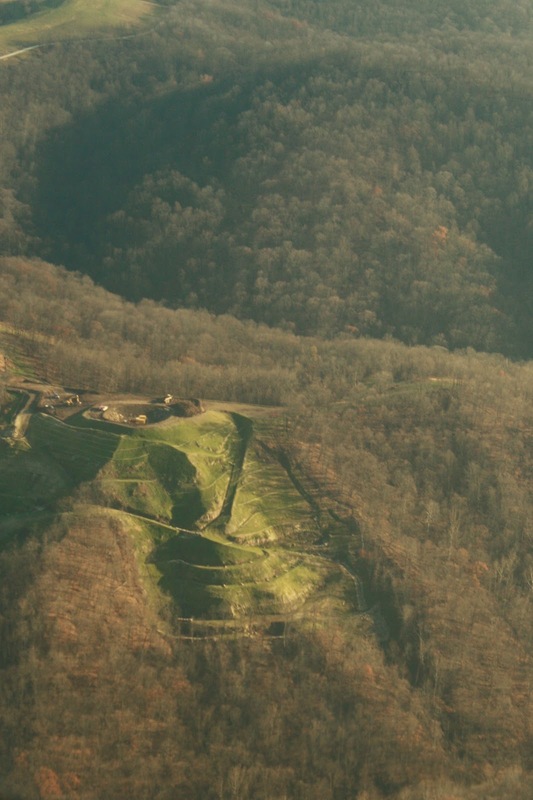 West Virginia law, House Bill 401 to be specific, has restrictions on how close drilling activity can be from occupied dwellings, streams, water wells, etc. According to the law, “The center of well pads may not be located within six hundred twenty-five feet of an occupied dwelling structure.” There are several issues with the way this law is worded, but the main problem is that the distance restriction is on the center of the well pad, not the boundary. Therefore, the edge of an active industrial site could quite easily overreach the already limited buffer zone. The proximity of houses and farms to industrial activity is an issue across the entire Marcellus Shale play. 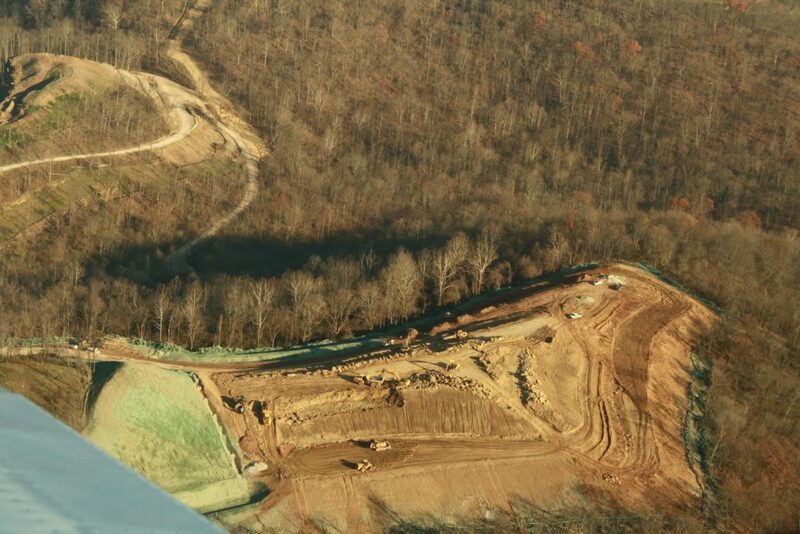 Here in SW Pennsylvania, several homes are immediately downhill of a large pad and the service road for two well pads goes through the bottom center of the image. 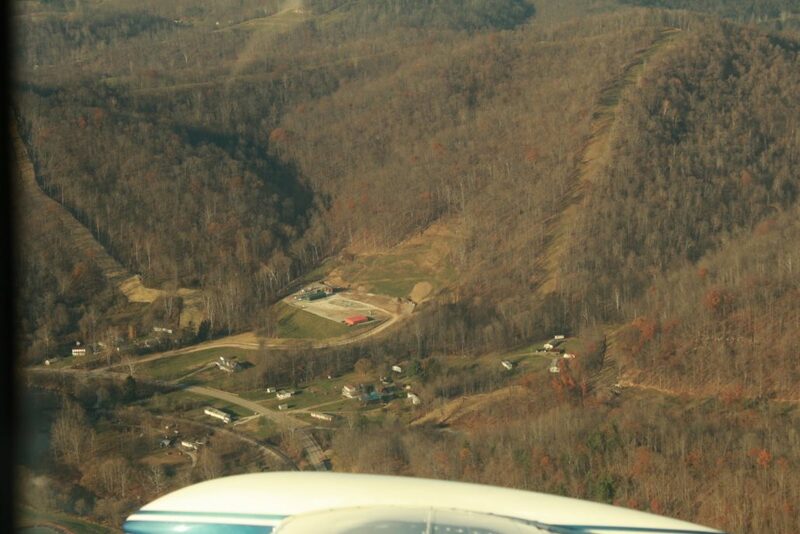 In Wetzel County, WV, Stone Energy’s Weekly pad (orange tanks in the center of the image) is surrounded by private homes. The green structures on the pad are separators and condensate tanks which remove and store ethane, butane, propane, and other gas “liquids” from the natural gas produced by the well. These units run constantly and at times emit sickening fumes that cause headaches and respiratory irritation. There are many more observations to make about hydraulic fracturing and unconventional shale gas development, and many more ways we want to look at it from the sky. These are just the most obvious issues illustrated by this round of images. 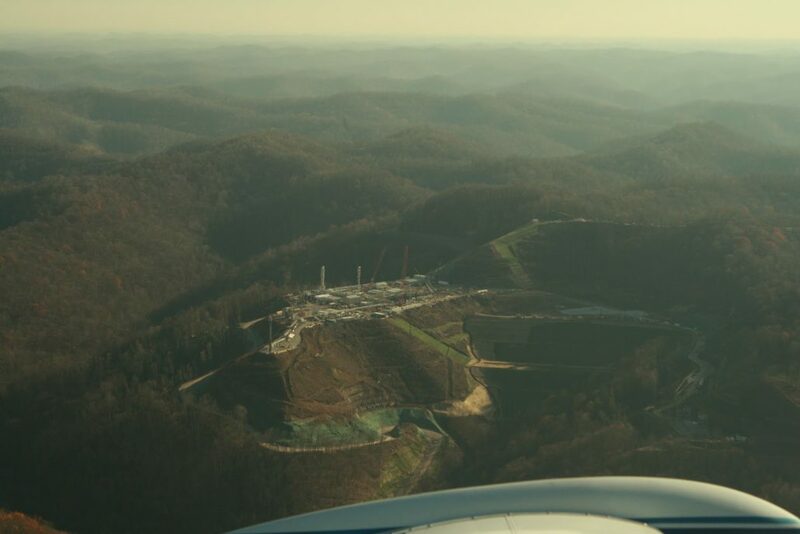 Even developed as responsibly as possible, it is undeniable that unconventional shale gas extraction will change the landscape of West Virginia for decades to come. Stone Energy’s Howell Pad: 16 acres of surface disturbance. With their summits pointed skyward To the Great Almighty's Land! Very well done! Given the speed of the activity, it is critically important to show what is happening here. I will take some exception to: "infrastructure, fragmentation, and air, noise, and light pollution mean very little if no one is actually impacted by it"
Don't these impacts mean a lot, regardless of where they occur? They impact the foundation of the great biological diversity contained in this landscape. I fear we will be much poorer for the loss, though it matters little if we fixate on $ over every thing else. Duly noted, and I have modified the post to reflect that point. There are so many variables, and so many approaches, I tend to focus on the direct public health and economic impacts, since those are the issues that tend to connect most with decision makers. You are absolutely right, the loss is great, regardless if anyone is in the woods to hear the proverbial tree fall.